A New Taur! [21 Feb 07] With four webbed feet! There's no lion in the latest Taur creature to hit the Web, but this newborn has an advantage that no liontaur can enjoy -- it exists! 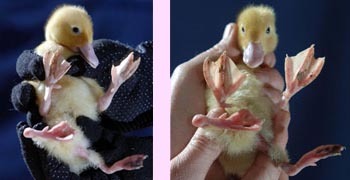 A baby duck has been born with four feet and wings! That makes it the most Taur-like creature to be found on God's Green Earth. Here are two news reports with pictures: check out the BBC and Yahoo News. On the likely chance that the links will go dead in the years to come, here are two photos of little "Stumpy," born in mid-February on a farm in Hampshire, England. NBC has some video of Stumpy in action. Alas, the video makes it clear that Stumpy mostly ignores his extra legs, which pretty much dangle behind him. Still, a taur in the news is good news indeed, and on behalf of Cayzle and the entire team here at Cayzle's Wemic Site, we wish the best for little Stumpy, including a long happy life and lots of quadrupedal kids with functional feet! Sadly, he lost a leg, per a 19 April 2007 report in the Telegraph. Then Stumpy found a lady-friend, per a 16 July 2007 report, originally reported at the Mail Online, but here linked at Gossip Rocks because they have a date and photos. And then Stumpy lost his other extra leg (it turned black and fell off), per a 2 May 2008 report in the Telegraph. Researchers at the University of Chicago were reported to be studying Stumpy's DNA for insights into mutations and birth defects, per a 27 Aug 2009 report in the Telegraph.